The best way to challenge the status quo, norm or even tradition is to gather the best scientists in the world…give them a hypothesis, myth or belief…and let them tear it apart with research, documented evidence and data. 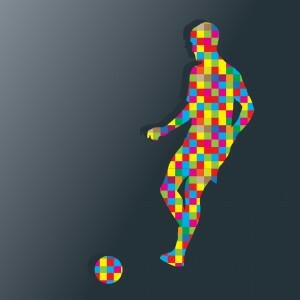 The best way to improve soccer performance is through the acquisition of soccer skills. A fair assessment would suggest that kids spend most of their time in training with the intention of improving technical skills. It would also be fair to conclude that current coaching practice is based on tradition, intuition…and emulation rather than empirical evidence. The following post is backed by empirical evidence and research…it will help us break down some of the myths causing our children to quit the game…and allow us to challenge coaches to self reflect and critically evaluate contemporary doctrine. A significant amount of research has been undertaken in recent years to identify important factors underpinning elite sports performance. This increase in research activity has been prominent in soccer. While those involved in professional set ups appreciate the importance of sports science, exercise physiologists have conducted the majority of work. Other sciences are gradually catching up like psychology and motor learning but it is clearly evident that the soccer world has embraced the biological sciences with greater enthusiasm than the behavioural or social sciences. It is much easier to evaluate the effectiveness of fitness programs than programs that try and change behaviour. Changes in body mass, aerobic and anaerobic capacity can be easily determined in the safe corners of any laboratory using standard equipment. But how would you measure and test anxiety levels, self-confidence, anticipation and decision-making? Children who are offered full time employment contracts by English Premier League Academies at the age of 16 years have (estimated average- Ward, Hodges, Williams 2004) devoted more than 10 years to soccer, investing an average of around 15 hours per week, 700 hours per year and a total of 7000 hours in specific practice activities designed to enhance performance. By the time a child makes his debut in the Premier League, the amount of accumulated practice is likely to exceed 10,000 hours. This shouldn’t be news to you… a significant investment in training and effort is required to reach an elite level of soccer. How do the above figures compare with your child’s training regime? Time required…and effort required to break into the Premier League. The intention of this post is to challenge the status quo and to highlight that every child can eventually play in the Premier League if they commit to the game. Parents, spectators and most coaches often imply that elite players are in some way “gifted” with unique abilities. In support of this presumption, scientists argue that we are not all born equal and that certain individuals may be endowed with characteristics that predispose them towards success. We’ve already established that a lot of training, practice and effort are required to reach an elite level. Hereditary… genetic factors play a role in shaping an individual’s response to practice and training. Skills are highly modifiable and adaptable to training…and every child will need to practice for many hours to develop and refine these skills. Helsen and colleagues examined the practice history profiles of professional and semi professional players in England. The amount of time spent in team practice was the strongest discriminator across skill groups. The professional players reached their peak in terms of the number of hours per week spent in practice (individual & team practice combined) at 15 years into their career with a total of 9333 practice hours. These are highlighted in figures 1 & 2. 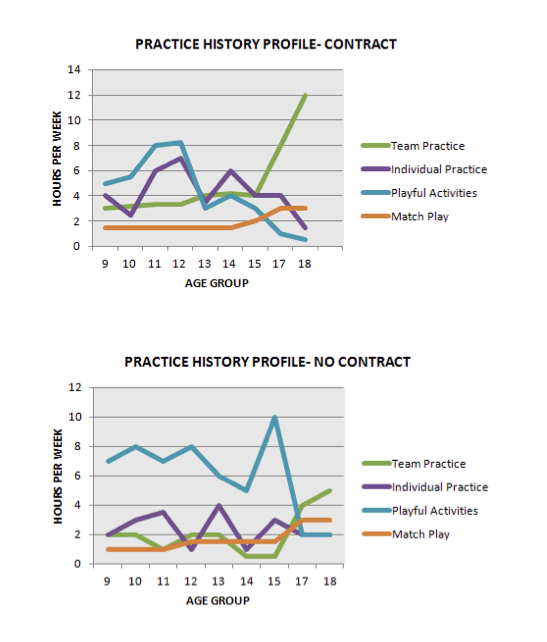 The players that succeeded in landing a professional contract spent a significant time in team and individual practice per week than the unsuccessful group (players that did not get offered a professional contract)…regardless of age, with the amount of time spent in team practice being the strongest predictor of skill. The contracted players spent twice the number of hours per week in team practice compared with the players that missed out. While the notion the professional players practice more than their sub-elite counterparts is not surprising, the amount of accumulated practice provides an astonishing portrayal of immense commitment required to become a professional player. Notice how the study concluded a commitment to training and obtaining 10,000 hours of training as the precursor to break into the Premier League. (Winner, Ward 2006) It is the commitment and motivation to practice that may well be the most important precursor to a professional contract; coaches at Premier League Academies in England considered that the motivation to succeed allied with the commitment to practice were more important than their initial skill set or talent. But the good news is this…you want to play professionally and perhaps break into the Premier League…commit to the game and begin your journey of 10,000 hours. Stop using genetics as your excuse…if you put in the hours, you will improve irrespective of your genetic make up.